Throughout Britain, at least once a week, cyclists rise early, early at least for their days off, to join their club mates for a ride, come rain or shine. These rides are both social and training; at our club we usually split into three groups, depending on ability or ambition and cover about 60 miles, mostly with a coffee stop somewhere about half way. Often, in the faster groups, these rides degenerate into races, riders battling out sprints for village signs, or pushing so fast they drop their colleagues. It’s all friendly. Well, mostly. Late yesterday, I rode the first nine miles on my own. 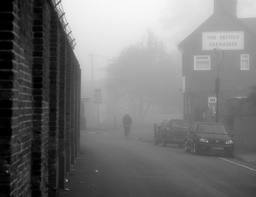 Enveloped in the lonely silence that freezing fogs bestows, I rode alone, hoping to catch the others. My glasses steamed up, condensation formed on the fingers of my gloves, overshoes and my knees as they pumped up and down, pushing far too hard. Having had no warm up before a big effort, I was blowing hard and relieved when the social group appeared out of the gloom. I joined the back of the group and recovered from the exertion. They rode a leisurely pace, chatting, waiting at the top of any hills for the slower riders, going just fast enough to keep the cold at bay. Occasionally the lights of cars appeared silently from the whiteness and villages unfolded from the mist. When riding in the cold there is a balance to be found. Go too fast and you over heat, sweat much more, so freeze when you slow or stop. Go too slow you never warm and suffer with the wind chill. It was cold yesterday and I was freezing when we arrived at the café. I glugged a painfully hot cappuccino, then set off with the middle group. The cloud now forming a thin blanket on the fields, our wheels in it, but above our heads was only blue sky. For me, it was as if the sun had raised the pace, not us. We raced along now, averaging well over 20mph, the group tight, closely following the wheel in front, chat forgotten and replaced by effort. It was brilliant; jerseys were undone as exertion and sunshine raised our temperature, tyres whooshing on the tarmac the only noise other than the occasional clunk of a chain shifting sprockets. Through villages, past farms, rows of trees and occasional parked cars, we flew, communicating hazards with hand signals or sometimes a shout. Perfect. Nearing home, we dropped down a hill, at least that’s what we call it in Cambridgeshire, back into the gloom. Glasses stowed once more, zips done up again up and I won the sprint for the final sign. I love days like that: the golden leaves of autumn are now nearly all gone and the fog heightens the solitude or togetherness of your situation. As you cycle through the countryside however, just occasionally the cold, silent fog gives way, revealing life and glorious reminders of summer rides long gone.